These sterling silver cross stud earrings from Apples of Gold Jewelry are the perfect jewelry piece to wear to carry a symbol of your Christian faith with you all day long. 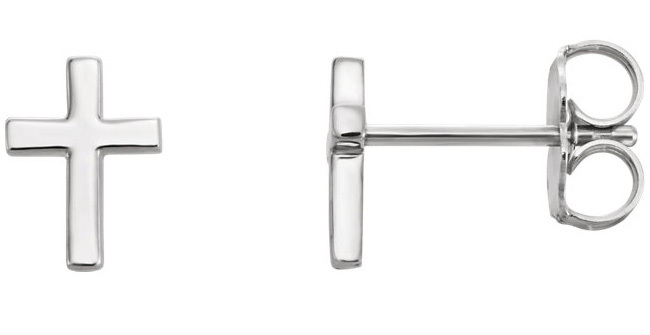 The .925 sterling silver cross design of these earrings and their posts are perfect for those looking for a subtle, yet fashionable pair of earrings that will look perfect for all occasions. The earrings each measure 7.5mm x 5mm in size, and they have secure friction push back closures to make getting the earrings on and secure easy! We guarantee our Sterling Silver Cross Stud Earrings to be high quality, authentic jewelry, as described above.